In August 2017 Roots Home & Abroad was born with the mission to educate and empower communities, both home and abroad, to create a sustainable quality of life. Our projects in College Park help enhance our knowledge of community work and support our efforts in Haiti. Last May, our President and Vice President traveled to Haiti. When they met with representatives of Leogane, they began planning a community center project. 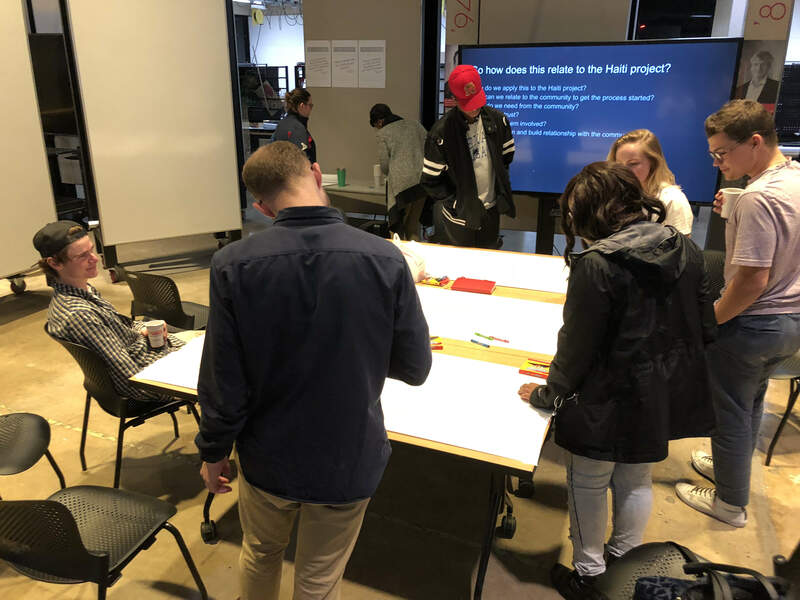 When they returned, they presented their project to Brian Kelly, director of the architecture program, and Ronit Eisenbach, a professor in the School of Architecture, Planning, and Preservation (MAPP). Kelly and Eisenbach offered Roots an opportunity to co-lead a research seminar and design studio in the coming academic year. Thus began the seven-student research seminar course on Haitian Culture and Sustainable Design in Developing Countries. In the weeks building the class, Roots was recognized in the MAPP Newsletter, Maryland Today, and on the BIG TEN Network. Although young, we have a motivated member base, support from MAPP, and a President, Brian Houstle, and Vice President, Nic Przybocki, who will be continuing their work with Roots as they build the student organization into a nonprofit organization after graduation. 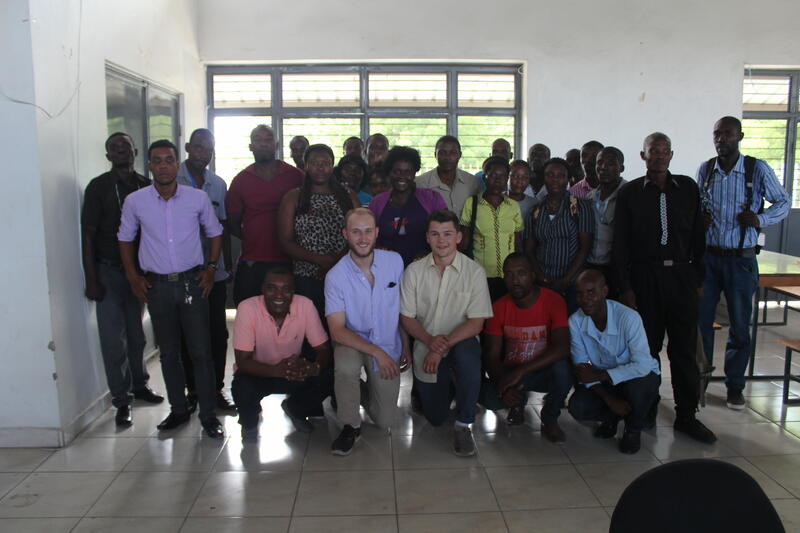 Brian Houstle and Nic Przybocki meet with Leogane's Mayor and thirteen district representatives. First, students will conduct research and site analysis. Currently, Roots conducts research through ARCH478X, our research seminar course on Haitian culture and sustainable design in developing countries. Seven students are compiling information into a booklet which will form a foundation for the designers and community members. In January 2019, five students along with faculty and staff from MAPP will be traveling to Haiti for the second meeting with community representatives of Leogane. There, they will choose the building site for the community center. When they return, the design stage will begin in ARCH408, the senior topical design studio. A group of students will begin designing a community center with the support of U.S. and Haitian architects. In the summer, the students will return to Haiti with the design in hand. Together with the community, they will finalize the design. When complete, the team will return to begin construction documents. With the help of local Haitian builders and craftsman, they will build a community center over the course of 3 to 5 years. Roots team brainstorms public interest design strategies. We need your help to send five students to Haiti. We have just received a Do Good Mini-Grant of $500 for the second year in a row. With that, we need $4,000 more to send students to Haiti in January. The $4,000 will grant each student a plane ticket, food for the week, a place to sleep, and in-country travel. If we are able to raise more than $4,000, we will be able to purchase goods to support the community of Leogane, such as toothbrushes, deodorant, and other hygienic supplies. Any amount you are able to donate helps impact this community. Thank you!